Sickness and injury bring horses to the Hagyard-Davidson-McGee clinic near Lexington. Strict standards of cleanliness help the doctors control the spread of disease. "We wash down the stalls with a detergent, scrubbing everything from the walls to floors to doors to feed buckets," says barn supervisor Mike Peel. "Following the detergent scrub, we spray 1 Stroke Environ disinfectant on everything, and when that dries, scrub everything with bleach. Then the steps are repeated. A mat that soaks feet with disinfectant is outside each stall." Even if you haven't stabled a sick horse in quite some time, a yearly stall scrub is just the ticket to keep disease at bay. "Many pleasure-horse barns really aren't designed for thorough disinfecting," says Margi Stickney. "There are, however, a few steps you can take to make your disinfecting program more efficient. One is to put two coats of enamel paint on porous concrete block. Another is to fill in any holes in the wood with caulking, then apply a heavy varnish." The idea is to prevent bacteria and viruses from finding a home in cracks and holes. Scrub the stall walls with detergent and let them dry, the Kentucky Horse Park instructor instructs. Pressure washers, if available, do a good job. "Start at the top of the stall walls and go down to the floor," Stickney says. "Be sure to sweep out all of the water when you're finished." Flooring in the clinic is primarily cement covered with rubber mats. This type of flooring is the easiest to disinfect, Stickney points out. Dirt floors really can't be properly disinfected, although regular cleaning can help prevent the spread of disease. If you have a mat on a dirt floor, be sure to periodically pull it out to dry the wet spots. After the initial detergent scrub dries, spray on the disinfectant. "Keep in mind that some detergents and disinfectants become inactive when sprayed on organic material such as manure," she says. "We use either 1 Stroke Environ or Tektrol. To kill a pathogen like rotavirus, you need to use a disinfectant that works on organic materials. It's critical to know what bacteria or virus you're dealing with. You'll want to match the chemical to what you are trying to fight." In most cases, don't rinse the disinfectant, except for water buckets and feed tubs. "Generally, we only disinfect the stall once, but you might want to repeat the process if you've had an especially contagious disease, such as strangles," Stickney says. Stall muck from a sick horse should not be spread in a field, but put in the compost pile. Disinfect outdoor feed tubs and water tubs periodically, Stickney adds, and immediately if a sick horse has had access. "And if you take your sick horse to the veterinarian in the trailer, it will need to be thoroughly cleaned and disinfected. 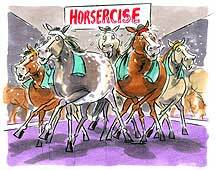 And remember to disinfect your clothes if you're moving from a sick horse to other horses." Pastures and paddocks can't be disinfected, but disease risk can be lessened by harrowing the manure, exposing it to the sun and letting it dry throughly. Be safety-conscious when cleaning. Use rubber gloves and goggles when spraying detergent and disinfectant, especially in an enclosed area. If you're steamcleaning, consider a rubber or synthetic waterproof suit. "Be sure to copy down the directions from the label regarding what the product is as well as first-aid instructions should the chemical get in the eyes or ingested," Stickney cautions. "We've found that over time and with use, product labels fade. It's important to know what you're using and the recommended first-aid treatment, just in case." Foaling stalls, in particular, need to be kept clean and disease-free. Gainsborough Farm, a Lexington, Kentucky thoroughbred breeding farm, follows stringent disinfecting steps. "We power-wash the stall after every foaling," explains manager Dean Leavy. "After the stall dries, we spray with Tektrol, a broad-spectrum disinfectant accepted by the state for use in quarantine situations." Once the Tektrol dries, the stall is rebedded with straw and made ready for the next mare. In the absence of such luxury--for those owners with dirt floors--Leavy suggests stripping the stall, letting it dry, then soaking it with disinfectant. Read the next horse diseases article on Rhinovirus.